As far as I can tell literary studies will remain committed to pre-computational intellectual formations for the foreseeable future and will do so from a position of quasi-aristocratic superiority over crass calculation, of which it will remain fitfully ignorant. One might say that my participation in the academic blogosphere is framed, for the moment, by engagement with the work of Franco Moretti. It began with a so-called book event at The Valve, a now dormant group blog I joined late in 2005. Jonathan Goodwin had organized an online symposium about Moretti’s Graphs, Maps, Trees. It went live on the web on January 2, 2006 and had contributions by 15 people. Eight of us were Valve contributors: John Holbo, Ray Davis, Matt Greenfield, Amardeep Singh, Adam Roberts, Bill Benzon, Jonathan Goodwin, and Sean McCann. There were guest appearances by seven: Franco Moretti, Matthew Kirschenbaum, Timothy Burke, Eric Hayot, Steven Berlin Johnson, Jenny Davidson, and Cosma Shalizi. I have no idea how many people contributed comments to those discussions, which unfolded over a period of three weeks. Most, but not all of these authors held academic posts (I did not). Two, I believe, did not have doctorates. The contributors came from all over the place and I wouldn’t hazard a guess about their backgrounds. Some were academics, I’m sure, and some where not. The symposium eventually became (self-published) book: Jonathan Goodwin and John Holbo, eds. <i>Reading Graphs, Maps, and Trees: Responses to Franco Moretti (Glassbead Books 2009). That was over a decade ago. It was a collective event that took place outside the ordinary confines of the academic world – my use of confines is, of course, quite deliberate. At the time Moretti was talking about distant reading. He had not yet become involved with computing and, necessarily, with people who know how to program then. He formed the Stanford Literary Lab in 2010 with Matthew Jockers, who had computer skills that he did not. The Lab issued its first pamphlet in, I believe, January of 2011: Quantitative Formalism: an Experiment. It was signed by Moretti and four others: Sarah Allison, Ryan Heuser, Matthew Jockers, and Michael Witmore. The most recent pamphlet, no. 16, was issued in November of this year: Totentanz. Operationalizing Aby Warburg’s Pathosformeln, by Leonardo Impett and Franco Moretti. That first pamphlet had been submitted to a prestigious journal but was turned down in terms that suggested that the intellectual method itself was being rejected, not just that particular argument. And so the group decided to sidestep the world of formal academic publication and publish its work in the form of stand-alone pamphlets. This is common enough in technical disciplines, where work will be published in the form of technical reports – though that work will sometimes/often then by published in journal form as well; but it was unheard of in the humanities. My point, then, is that the literary lab has worked at the edge of the academic world. It is located at a prestigious university, and its pamphlets bear the imprimatur of that university. But they do not exist in the world of formal academic publication. 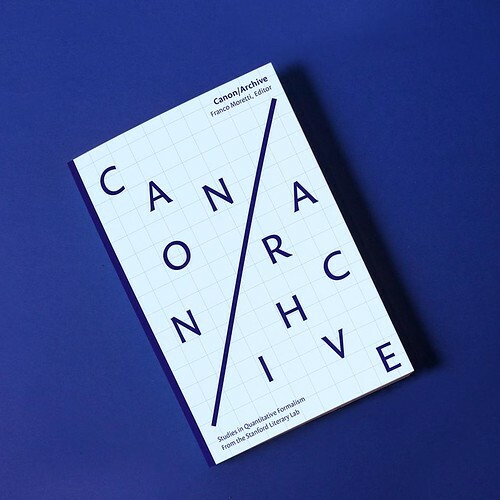 Canon/Archive: Studies in Quantitative Formalism by Franco Moretti (Author, Editor), Mark Algee-Hewitt, Sarah Allison, Marissa Gemma, Ryan Heuser, Matthew Jockers, Holst Katsma, Long Le-Khac, Dominique Pestre, Erik Steiner, Amir Tevel, Hannah Walser, Michael Witmore, and Irena Yamboliev, published by n+1. Note the term, quantitative formalism. Moretti now refers to this approach as computational criticism rather than distant reading, though some in the field use the latter term. I have written an essay/review about the book and published it in 3 Quarks Daily, December 11, 2017, which is not an academic journal: Moretti and the Stanford Literary Lab: Computational criticism in two senses and the prospect of a new approach to literary studies. The epigraph to this post is the final sentence of that essay/review. Will the future of literary studies unfold outside departments of literature and their associated societies and journals? 3 Quarks Daily archive is missing the Dec 2017 posts and so the Moretti related review - could you make it available elsewhere please? You can download it at SSRN HERE or Academia.edu HERE.